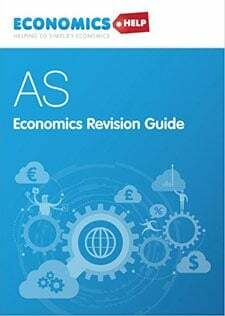 This years OCR F585 global economy pre-release stimulus material is about Estonia and its economic performance. This post gives a few extra graphs about the state of the Estonian economy and considers important issues and questions, related to Estonia. From the early 2000s Estonia experienced rapid economic growth as it benefited from joining the EU (in 2004) and receiving greater inward investment from Europe. Estonia’s economic growth since 1991 has been based on its transition to a market economy, e.g. policies such as privatisation. It also benefited from low inflation and macro-economic stability. It has also encouraged inward investment through low taxes. In the boom period of 2000-2007, Estonia was able to borrow on European capital markets to finance investment, which spurred strong growth in exports and international trade. 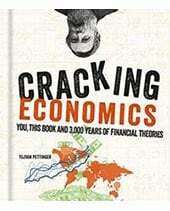 However, the credit crunch and EU crisis of 2007-11 harmed Estonia’s economy. It’s reliance on EU loans meant that it saw investment drying up and GDP contracted by 5% in 2008 and by 14% in 2009. In the recession, the Estonian government embarked on a controversial austerity programme, which saw spending cut by up to 20%, to try and reduce the budget deficit. After a deep recession, the Estonian economy has shown a strong recovery, though unemployment is still over 10%. 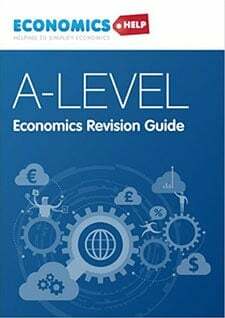 Firstly, these are some elements of the Estonian / Latvian economy not mentioned in the extract. In particular, the extract gives little mention of unemployment. 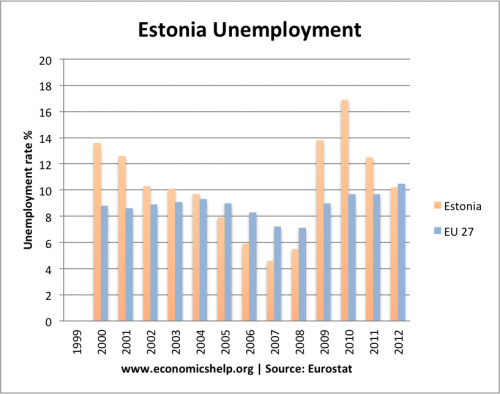 Knowing the unemployment rate, helps give a wider perspective on Estonia’s economic situation. After falling to less than 5% in 2007, during the economic crisis unemployment in Estonia increased rapidly reaching a peak of 17%. However, unemployment in Estonia has now fallen to just below the EU27 level, but it is still high at over 10%. Unemployment was even higher in Latvia. 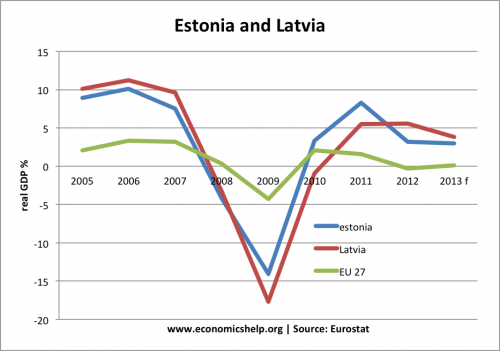 This suggests that Estonia achieved a more successful recovery than Latvia. Estonia has been much successful than Greece. Since the recession of 2008-09 Estonia has posted stronger recovery than other countries within the EU. However, if you have a deep recession, it is easier to recover lost output. It also depends which way you look at real GDP. This shows that because of the depth of the recession in 2008 and 2009, where output fell 20%, the economy is still below its pre-crisis level. Evaluation point. This shows there are different ways of interpreting data. For example, the Nobel economist Paul Krugman got into a heated debate with the Estonian president about the relative success of the Estonian economy. Krugman argued Estonia is no ‘miracle story’ The Estonian president argues Krugman was being unfair to the success of Estonia. Some argue Krugman’s graph is misleading because he starts at the end of the bubble. 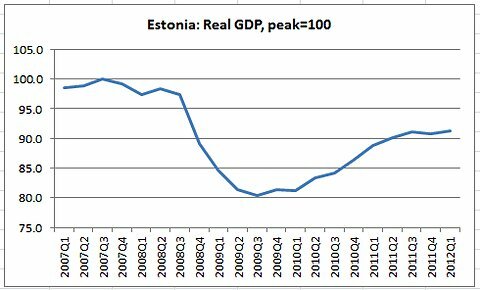 If the graph started in 2001 or even 2005, it would show Estonian GDP is higher than previously. 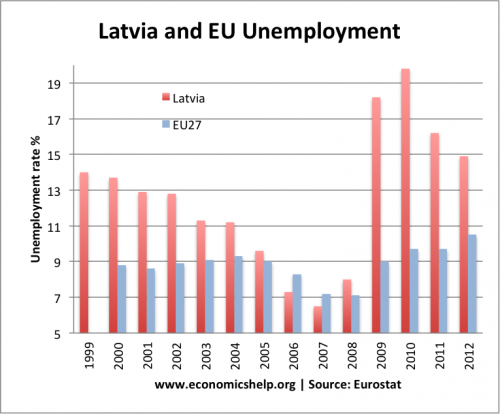 However, the fact unemployment rose to 16% and is still over 10%, suggests there is significant lost capacity in Estonia, but there is still better recovery than other EU countries, which embarked on similar policies. This current account deficit suggests the economy was relying too much on foreign inflows to finance investment and consumption. In the boom period, Estonia was able to finance a large current account deficit by attracting capital inflows (long term investment and short-term capital flows). However, in 2008, these capital flows dried up, and this led to a necessary rebalancing of the economy. Because the Estonian currency was pegged to the Euro, they couldn’t devalue the exchange rate. Therefore, the current account deficit was reduced through internal devaluation – lower price of exports, lower wages, austerity measures to cut government deficit. This also led to falling import spending, but, at the cost of higher unemployment. Some argue that Estonia may have been able to deal with crisis more effectively, if they had been willing to devalue and pursue less fiscal austerity. Given the problems Eurozone countries have faced (prolonged recession in Spain, Greece, Italy and Portugal) are the benefits of Eurozone membership really worth it for Estonia? 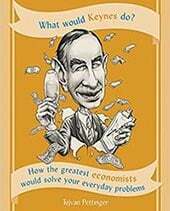 Issues to consider with the Estonian economy? What measures should Estonia consider to be economic success? e.g. – GDP, unemployment, relative poverty, environmental stats, health care standards? To what extent has Estonia benefited from globalisation and free trade? 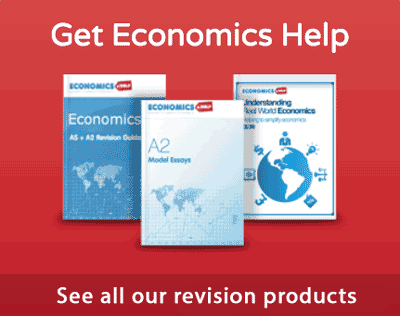 Is unemployment a price worth paying for macro-economic stability? ← Will the Eurozone Breakup?